A wound or injuries are caused by any accidental damage to the skin due to physical, chemical, and thermal injury. However, wound healing refers to the process of repair and regeneration of skin i.e., dermis and epidermal tissue of the body. Healing process involves inflammation, cellular proliferation, and contraction of collagen lattice formation (Guo and DiPietro, 2010; Velnar et al. 2009). In clinical practice, wounds creates a challenge with respect to severe pain, disability, bleeding, and inflammation. The tissue normal continuity would be braked in wounds that results in disruption of different kinds of cellular and molecular events. The healing process involves migration and proliferation of cells such as fibroblast, keratinocytes, endothelial, and epithelial cells, which results in wound contraction and synthesis of new extracellular matrix (ECM). Angiogenesis, epithelialization and the process of collagen formation are initiated by the fibroblast cells (Tao et al. 2007). Keratinocytes migration in injured epidermis and hair follicle results in new tissue formation by proliferation of cells at wound edge by re-epithelialization phase (Schafer and Werner, 2007; Gurtner et al. 2008). However, this process might hampered in the presence of microbial infection or free radicals, which results in clinical health complications. In everyday pathology, wounds complication and its burden increases and cause of morbidity and mortality (Natarajan et al. 2000; Alonso et al. 1996). In order to reduce the wound burden, researches are being focused to discover some new therapeutic approaches to promote wound healing, which must save the patient from severe complications and treatment cost. Alternative and complementary medicines in different forms have been used to accelerate the wound healing process (Reuter et al. 2009; Schmidt et al. 2009). Energy medicine is one of the successfully reported complementary and alternative medicine (CAM) in different clinical benefits Tabish (2008). Biofield Energy Healing approach has been reported with significant results as alternate medicine. National Center for Complementary and Alternative Medicine (NCCAM), defined Biofield Energy Therapies and its importance as a complementary medicine domain (United States National Institutes of Health, 2007). Scientific reports of Biofield Energy Treatment has been published in many fields such as improvement in cancer patient (Giasson and Bouchard, 1998), arthritis patient Peck (1998), reduced pain and anxiety (Turner et al. 1998), and in wound healing (Funk et al 2009; Schlitz et al. 2012). Mr. Mahendra Kumar Trivedi, one of the renowned Biofield Energy Healer significantly studies the role of Biofield Energy Treatment (The Trivedi Effect®) in cancer research (Trivedi et al. 2015; Yount et al. 2013), microbiology (Trivedi et al. 2015a, b, c, d), agriculture and livestock (Trivedi et al. 2015e, f, g, h), nutraceutical and pharmaceutical compounds (Trivedi et al. 2015i, j, k, l), materials science with altered physiochemical properties of different metals and ceramics (Trivedi et al. 2015m, n). Hence, in order to evaluate the effect of the Biofield Energy Treatment and its impact on wound healing, in vitro scratch assay using HaCaT cell line was used. In vitro assay would always be a preferred method of analysis, which helps to analyze the cell migration and cell interactions. Scratch assay is an inexpensive and valuable tool to study wound healing that would monitored by imaging method using time-lapse microscopy (Liang et al. 2007). The present study aimed to evaluate the effect of Biofield Energy Treatment (The Trivedi Effect®) on HaCaT cell line and DMEM using scratch assay to determination cellular migration and proliferation. Dulbecco's Modified Eagle Medium (DMEM), fetal bovine serum (FBS), and Recombinant Human Epidermal Growth Factor (Hu-EGF) were purchased from Gibco, Genex Life Sciences Pvt. Ltd., India. Ethylenediaminetetraacetic acid (EDTA), trypsin, and NaHCO3 were purchased from Sigma, USA. Antibiotics solution and Penicillin-Streptomycin were procured from HiMedia Pvt. Ltd., USA. All the other chemicals used in this experiment were analytical grade procured from local vendors in India. HaCaT (Human keratinocyte cell line) cells were procured from National Centre for Cell Science (NCCS), Pune, India. HaCaT cell line was maintained in the growth medium DMEM supplemented with 15% FBS, with added antibiotics penicillin (100 U/mL) and streptomycin (100 μg/mL). The growth condition of cell lines were 37ºC, 5%CO2, and 95% humidity. The cells were sub-cultured by trypsinisation followed by splitting the cell suspension into fresh flasks and supplementing with fresh cell growth medium. Hu-EGF (100 µg/mL) in PBS stock (positive control) was diluted in DMEM to achieve the working concentration corresponding of 30 ng/mL in cell plate. An aliquot of HaCaT cells in a T-25 cell culture flask and an aliquot of DMEM culture medium were received the Biofield Energy Treatment (The Trivedi Effect®) under laboratory conditions for ~3 minutes from a distance of ~25 cm. The energy transmission was done without touching the cells and media. After Biofield Energy Treatment, the medium and the cell lines were used for the estimation of in vitro wound healing potential using scratch assay. Following treatment, Biofield Energy Treated and untreated T-25 flask were incubated till one week in a CO2 incubator at 37°C, 5%CO2 and 95% humidity. Besides, the Biofield Energy Treated and untreated DMEM were stored at 4ºC till cell culture. Group I served as cells in the untreated DMEM medium (200 µL of phenol-free DMEM supplemented with 10% Charcoal-dextran of fetal bovine serum (CD-FBS). Group II defined as the positive control (Hu-EGF in DMEM), i.e., cells in DMEM with Hu-EGF at concentration 30 ng/mL. Group III was referred as HaCaT cells in the Biofield Energy (The Trivedi Effect®) Treated DMEM. Group IV served as the Biofield Energy Treated HaCaT cells in the untreated DMEM. HaCaT cells were counted using an hemocytometer and plated in 12-well plates at the densities 0.08 X 106/well/mL of cell growth medium. The cells were incubated overnight under growth conditions and allowed for cell recovery and exponential growth. After overnight incubation, the Biofield Energy Treated and untreated cells were subjected to the serum starvation in the treated and untreated DMEM for 48 hours. Mechanical scratch representing wounds were created in the near confluent monolayer of cells by gently scraping using sterile 200 µL micropipette tip. The scratched area was then monitored after 48 hours for closure of wound area. The photomicrographs were done at the selected time-point for quantitative assessment of migrated cells and its area of wound closure using digital camera, which was connected to the inverted microscope. Further, keratinocyte cells migration distance in each wells were monitored using WimScratch Image analysis software. All the observations were calculated and compared with baseline values (Fronza et al. 2009). The results of wound healing using scratch assay in HaCaT cell line with the Biofield Energy Treated cells and Biofield Energy Treated DMEM were performed and the results were monitored and represented images are presented in Figure 1. The figure showed the rate of keratinocytes migration in the Biofield Energy Treated DMEM group was higher as compared with the Biofield Energy Treated cells, when compared with the positive control (EGF). The percentage of cell migration and percentage of scratch area after 48 hours in all the four tested groups are summarized in Table 1. The confluent monolayer of HaCaT cells were scratched and cells migrations was recorded after 48 hours. The results showed a significant migration and its represented photographs are shown as Figure 1(a) baseline or control group, 1(b) EGF group at concentration 30 ng/mL, 1(c) Biofield Treated DMEM with untreated cells, and 1(d) the untreated DMEM with the Biofield Energy Treated (The Trivedi Effect®) HaCaT cells. The percentage change in scratched area can be clearly visible with significant decreased in percentage value to 3% (EGF group), while percentage scratch area in the baseline control group was 11.3%. Further, Biofield Energy Healing in DMEM was also monitored with significant decreased percentage of scratched area to 7%, while Biofield Energy Treated HaCaT cells showed 14% scratch area that was greater than the baseline control group (Figure 1). Figure 1: Cell migration potential of Biofield Energy Treatment on HaCaT cell line and DMEM in scratch assay using WimScratch Image analysis. Micrographic pictures were taken after 48 hours of the induced scratch at 50 times magnification. 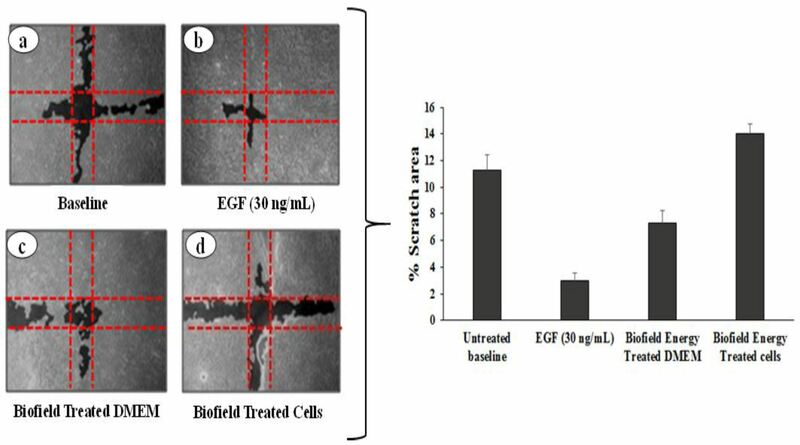 Representative pictures of (a) untreated baseline control group; (b) EFG at 30 ng/mL; (c) Biofield Treated DMEM; and (d) Biofield Treated HaCaT cells. In addition to, Biofield Energy Treatment significantly reported with an increased cell migration rate and the percentage values were varied according to the treatment approach. The results of cell migration and scratched area percentage are summarized in Table 1. It was found that the Biofield Energy Treatment in HaCaT cells did not show any migration, while Biofield Energy Treated DMEM group was analyzed with significant cell migration rate by 35.4% with respect to the untreated baseline control group that could be useful and important for wound healing activity. The positive control (EGF, 30 ng/mL) showed a significant cell migration i.e., 73.5% with respect to the untreated baseline control group. Table 1: In vitro evaluation of Biofield Energy Treatment in HaCaT cell line and DMEM for wound healing activity using scratch assay. This indicated that the Biofield Energy Treatment (The Trivedi Effect®) in media (DMEM) showed a significant migration of keratinocytes cells with reduced scratched area as compared with the Biofield Energy Treated cells. It can suggested that Biofield Energy Treated DMEM showed a significantly improved keratinocytes migration, as monitored in 48 hours period with improved healing rate of wound. In vitro wound healing scratch assay is mostly used to study the cellular migration and cells near the edge of wound moves towards edge opening at different time-point. The migration and spreading capabilities of keratinocytes HaCaT cells can be best possibly assessed using a scratch wound assay. It measures the expansion of a cell population on the surfaces, which reflect the healing potential. Besides, it was reported that scratch assay has one of the major advantages that the results would mimics the cell migration to some extent similar to migration of cells in in vivo system (Liang et al. 2007). However, for analysis of epithelial or mesenchymal cells migration, scratch assay has been considered as a standard in vitro wound healing model (Hosoi et al. 1985). It reflect the movement of cell and its interaction with matrix that is required and takes place in wound healing (Fronza et al. 2009). The experimental result suggests that the Biofield Energy Healing approach as alternative method to promote wound healing in HaCaT cells migration rate. The study data suggest that Energy Healing on media would be significant as compared with the Biofield Energy Healing treatment on cells. This treatment approach might be used as a significant method for healing and promoting the cell culture and its integrity. The importance of several complementary and alternative medicines, Energy Healing by wound care professional has been used against different wound cases over the past two decades Dorai (2012); (Goodwin et al. 2014); (Hines et al. 2015). It might be expected that on exposure of Biofield Energy Treatment on DMEM, cell migration, proliferation rate was increased, which results in improved wound healing. Distant healing in surgical wound has been reported in a study by Schlitz, et al., 2012 (Schlitz et al. 2012). Besides, scientific report has been published with respect to improved healing rate by significant change in wound closure time, fibroblast proliferation, etc. in the presence of low frequency electromagnetic fields (Seeliger et al. 2014). The scratch assay analysis and cellular migration would reflect the second phase of wound healing with keratinocytes or fibroblast migration (Velnar et al. 2009). It was found that interacting the energetic fields, regenerative healing was reported in animals, and associated with the innate electromagnetic energy fields Becker (1960). The low frequency of electrical currents, along with the associated magnetic fields, can be measured and found in the human system Becker (1961). The combination of low frequency electromagnetic fields are complex and dynamic, and are associated with the dynamical processes like brain and heart function, blood flow, ion transport across the cell membranes, and various biologic processes, will contributes to the human Biofield (Becker and Selden, 1985). Based on the results, it can be assumed that Mr. Trivedi’s Biofield Energy Healing approach (The Trivedi Effect®) in DMEM would be significant in maintaining the cells integrity with improved wound healing in HaCaT cell line. In the present experimental, an established in vitro wound healing model was used in order to elucidate the potential use of Biofield Energy Healing (The Trivedi Effect®) on DMEM and HaCaT cells in 48 hours study period. The cell migration analysis showed 73.5% cellular migration rate in EGF group, while Biofield Energy Treated DMEM was observed with 35.4% migration rate, while no migration was reported in Biofield Energy Treated cells as compared with the baseline control group. Further, the percentage of scratch area was significantly reduced by 7.3% in the Biofield Energy Treated DMEM, while it was increased by 14% in the Biofield Energy Treated cells. However, positive control EGF showed 3% scratched area, suggest significant wound healing. Overall, study results conclude that Mr. Trivedi’s Biofield Energy Treatment has the capacity to improve the wound healing rate in HaCaT cells using Biofield Energy Treated DMEM media through an improved keratinocytes migration rate results in improved wound healing potential. Hence, The Trivedi Effect® can be used as a Complementary and Alternative Medicine (CAM) in cell culture media as an alternate treatment approach for wound healing along with other skin-related disorders such as eczema, diaper rash, chickenpox, measles, warts, acne, hives, wrinkles, ringworm, seborrheic dermatitis, skin cancer, rashes from bacterial or fungal infections, rashes from allergic reactions, raised bumps that are red or white, cracked skin, discolored patches of skin, fleshy bumps, warts, or other skin growths, changes in mole color or size, a loss of skin pigment, scaly or rough skin, peeling skin, ulcers, open sores or lesions, dry, excessive flushing.